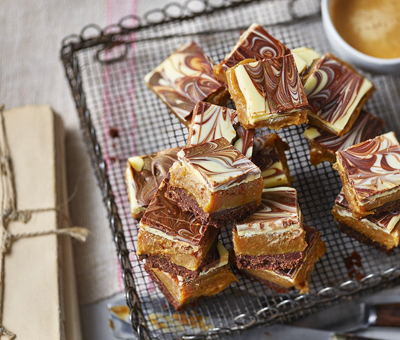 Try this delicious spin on our Millionaire's shortbread. Instead of swirling the white chocolate in to the dark chocolate, swirl in the dark chocolate in to the white chocolate for a marbled effect. These layers of crumbly shortbread, sticky caramel and chocolate will also hit the jackpot. Combine the crushed biscuits and the melted butter, press into the tin. Chill for 20 mins. Heat the sugar and remaining butter in a non-stick pan gently, stirring, until melted. Add the Carnation condensed milk and bring to a rapid boil, stirring continuously. Cook for a minute or so or until the filling has thickened. Pour the caramel over the base. Cool, then chill until set. Melt the chocolate in separate bowls. Pour the white chocolate over the caramel and then add spoonfuls of the melted dark chocolate. Swirl together with a spoon for a marbled effect. Chill until set then lightly brush over the gold edible glitter. Remove from the tin and cut into squares – dip your knife in hot water (then dry on kitchen towel) to make it easier to cut through the chocolate. Keep in an airtight container in the fridge for up to 2 weeks!